This post expands on the article I wrote for ELTA newsletter. The post consist of two parts (Part 1 here). Part 1 focuses on the definition and components of fluency, while Part 2 suggest practical ways of developing fluency and addressing specific issues hindering fluency. In Part 1, I talked about what speaking fluency is and what might stop students from developing it. Now, armed with that knowledge, let’s see what we can do to overcome those difficulties. How many times have we heard repetition is the mother of all learning? Turns out, it really is! Paul Nation, my go-to source for everything ESL, suggest “repeated practice on the same material so that it can be performed fluently” as an effective approach to developing fluency (in Nation & Newton, 2009:157). To ensure that learners do not become bored with repeating the same message, they suggest changing the audience for each subsequent retelling, and introducing a time limit. A technique that incorporates both suggestions is 4/3/2 where learners repeat the same text with the time limit decreasing from 4 to 3 and then 2 minutes, speaking to a different partner every time. Research (Nation, 1989) shows that 4/3/2 helps learners increase the rate of speech and reduce pauses and hesitations. In addition, repeat performances help learners build confidence in speaking. I like to combine this technique with a task-based approach for a complete speaking lesson which can be done with minimum (or none!) materials and be tailored to any level/grammar or vocabulary area/subject matter. In this example, pre-intermediate level learners are revising the use of past tense and the language related to people’s lives and life events by delivering a short talk about their personal hero. The lesson handout is here: Personal Hero Lesson Handout and while it can’t be readily used by anyone else (because it talks about my personal hero who happens to be my grandmother), it serves as an example of how easy it is to create a lesson out of thin air, and may be used as a template of sorts. This post expands on the article I wrote for ELTA newsletter. The post consist of two parts. Part 1 focuses on the definition and components of fluency, while Part 2 suggest practical ways of developing fluency and addressing specific issues hindering fluency. Whether you are teaching English as a second or foreign language, in a private language institution or a state university, a large number of students will say that the reason they want to learn English is ‘to be able to speak English fluently’. Moreover, upon reaching a certain level of English proficiency, learners are expected to demonstrate increased fluency – a look at textbooks of B1 level and above will show you that they include increasingly complex speaking tasks which require students to produce longer stretches of language. However, in my experience, learners are not given enough resources and strategies that allow them to consciously work on developing their speaking fluency. So how DO we help our students get there? Let’s start by figuring out what fluency actually is. Running Dictation: Run, Student, Run! As you can probably guess from the name, it involves running and dictating. The teacher selects a text for dictation – depending on the level and the language you want your students to notice/practice. The text could be something you create yourself or a text from your textbook. Students are organized into groups (or pairs if you have a smaller class). One person in each group will be a writer (or secretary), other members of the group will become runners. Make sure students rotate their roles and take turns being writers and runners. Set the rules. Some important rules are that there can be only one runner at a time in a group and they cannot use any recording devices – i.e. no mobile phones or pens and papers or shout their sentences across the room. The teacher either keeps the copy of the text on them, or makes several copies and puts them up in class or outside of the class. The first option is the easiest in terms of control. The second option still lets you keep an eye on everything, but lets the students spread around. Putting the texts outside the class provides students with a bigger outlet for their energy – they will need to run further, but it’ll be harder to check that no cheating is going on (e.g. students aren’t taking sneaky photos of the text) and you need to make sure you aren’t disrupting other classes. The runners look at the text and try to memorize as much as they can before running back to their partner(s) and dictating their portion of the text. The runners can go back as many times as they need in order to complete the text, as long as they follow the rules. When a group says they are done, the teacher checks the text, and either accepts it or asks the group to work on it some more. Alternatively, the students get the original text and compare it with their version. Make sure there is a follow-up to the dictation – the follow-up can include focus on grammar, answering questions about the text, re-arranging the sentences or parts of the text (see below for ideas). The greatest thing about running dictation is its potential for shaking up your lesson – by getting your students moving and competing with each other, you get them excited about the topic at hand. Obviously, you wouldn’t want to do this every lesson or the activity will lose its appeal, but using it now and again will help you energize your class. In addition, running dictation is a fun way to introduce/practice procedural and functional language – e.g. How do you spell that? Sorry, did you say we WANT or we WANTED? Also: capital letter, comma, new sentence, new paragraph etc. Finally, and most importantly, this activity gets students to use a variety of skills and processes – speaking, listening reading, writing, negotiating of meaning, and engaging short-term memory. This also means the activity has the potential to engage learners with various leaning preferences. Now, how cool is that? You can use running dictation to help students notice certain language points. The text you s elect/create can contain a high occurrence of certain grammar items, e.g. articles or sentences with third person singular in Present Simple. Let’s say you want to focus on the use of present continuous to describe annoying habits. The text would contain sentences like ‘My partner is always copying my homework’ and after the students have the complete text, you could ask them questions like ‘Are the sentences about what is happening now or what happens regularly? How do we know? How does the author feel about these things’?. I used to think that presenting at conferences was for big names in ELT or for very academically inclined teachers. I am so glad that my colleague and friend CeAnn Myers disabused me of this notion when she offered to guide me through the process of applying to participate in a conference as well as co-present at one. After working together on our proposal and sending out a few applications, we were accepted to present at the 36th annual TESOL Greece convention where we talked about PBI (project-based instruction) by showcasing a Projects Class CeAnn designed and we both taught at a preparation program at a private university in Turkey. Conferences are great for your career (and your mood) for a number of reasons. First, there is the obvious benefit of learning new things and walking away armed with new ideas and tools. Secondly, it’s an excellent opportunity to network and meet new friends, potential employers and future research partners. Finally, you get to go to a new place! Even if it’s only for a few days and even if the conference schedule if super full, you can always get away during lunch or arrive a bit early to do a bit of sightseeing. Some conference will include some sort of sightseeing element – for example,at the last TESOL Greece conference we attended, the conference participants were taken on a guided tour of the Athens Archaeological museum and it was the highlight of our trip! How I found out about Kahoot! “I did not sign up for this! I am an English teacher, not a wildlife wrangler! And I am never playing competitive games in my classroom again!”, I was thinking to myself as I watched my 20-student class erupt into shouts, scattering answer cards around the classroom and stabbing the air with uncapped (oh horror!) markers for emphasis. It all started well enough. In order to review some of the material we covered in the last few weeks, I devised a PowerPoint-based quiz. Students were working in groups and had to answer a variety of questions, i.e. finding a spelling mistake in a sentence, choosing a word that matches the definition on the screen etc. The teams had to write their answers on large answer cards and lift them in the air. The first team who displayed a correct answer (including correct spelling) gets a point. And here lies the problem. Hard as I tried, I was never sure if I made the right call as to who was the first. The students didn’t help the matters, claiming that it was definitely their team who answered first, even as their teammates were still writing an answer down. It was during one of these ‘WE WERE FIRST TEACHER’ shouting matches when a student asked me why I wasn’t using Kahoot! He had me at ‘you answer with your mobile phone and the game sees who was first’. I questioned the student about which of my colleagues used this amazing game and set to researching. What is Kahoot! and how does it work? As I found out, Kahoot! is a free online platform for creating and running learning games. It can be used to create multiple-choice questions with embedded pictures and videos. . Teachers can either create their own Kahoots or search for publicly available games. There are tons of Kahoots out there based on specific textbooks such as New English File or specific grammar points. You can also check out trending Kahoots as well as most popular ones, although bear in mind that not all of them will be related to language learning – Kahoot! is popular in all learning environments and subjects including regular school subjects like chemistry or math. Now that I come to the end of my own DELTA journey and I would like to share my experience with all you potential DELTA-ers out there in the hope that it helps you. The order in which I did my DELTA was Module 1 – Module 3 – Module 2. There is no set order in which you need to do the modules, and I found that the way I did worked very well for me. While preparing for Module 1, I read a wide variety of books and as a result, developed a good understanding of a whole host of teaching issues. With Module 3, I got good at academic writing and the whole drafting/revising/re-drafting process. All of the above came useful during Module 2. It was by far the most intensive of the modules, mostly because in 1 and 3 you can pace yourself and space out the studying/writing but in Module 2 there is no time to pause – you are always writing assignments or planning lessons or panicking about how much you have to do and stress-eating cheese (true story). A very blurry photo right before the exam – I was vibrating with nerves! I took my Module 1 exam in December, 2014 and I got Pass with Distinction. To prepare for the exam, I took an online course with ITI Istanbul. It was conducted via Moodle and there were lots of useful links and how-to guides, including ‘What to do first’. Our exam practice papers were graded promptly and we received constructive feedback. One great thing about the course is that when the time comes to register for the exam, should you decide that you are not quite ready yet, you can enroll into the next online course free of charge. Another useful feature was the forum where you could post all your silly questions and concerns which were answered by your peers and tutors. I outlined some tips for Module one specifically in this post. 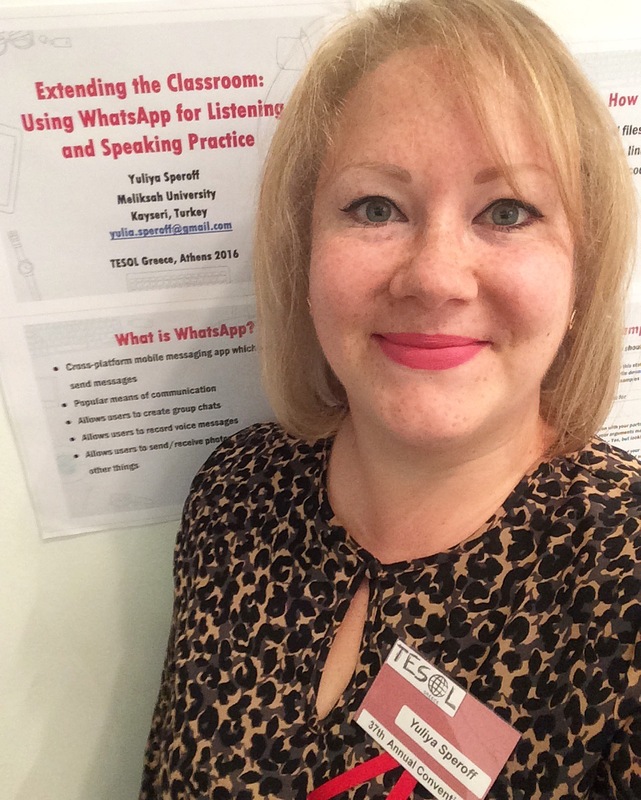 This post expands on a presentation titled Extending the Classroom: Using Whatsapp for Listening and Speaking Practice which I made at the TESOL Greece 37th Annual Convention 2016 in Athens, Greece. Mobile phones are everywhere, including the classroom, and they are here to stay.The multitude of articles and blog posts providing ideas on using mobile phones, WhatsApp or talking about mobile learning attest to that. Finding practical and meaningful ways to utilize mobile technology in the classroom has become an important part of my teaching practice and I am very happy to have developed activities that use mobile phones to practice English in a very organic way. I also found that having students do things with instant messaging apps like Whatsapp outside the classroom fosters learner autonomy and peer learning. I did my CELTA with the Campbell Institute in Wellington, New Zealand in 2013 and was awarded Pass A, the highest grade which was was awarded to only 5% of CELTA trainees that year. Despite the fact that the course was every bit as intense as I thought it would be, it was an extremely positive experience.Our teaching practice groups (elementary and intermediate levels) have been patient with us and enthusiastic about learning. We had the most amazing tutors on this course: Mo Killip, Jo Leach and Annie Marenghi – collectively and individually -were everything a teacher trainer should be: patient, encouraging, extremely knowledgeable, inspiring and supportive. When I enrolled into the course, I had been teaching for about 5 years and I still learned loads and loads of things as well as made some great friends among my fellow trainees that I keep in touch with to this day. Reflecting on my experience, I came up with some tips on doing the CELTA – and some lessons I learned from my own experience on the course. I suggest reading these tips prior to the course and then going over them again once you start on the course and learn about the things I mention here. If you are doing a full-time face-to-face CELTA course, forget about working and possibly socializing. You won’t be much fun to socialize with anyway because nobody will want to hear about how cool Cuisenaire rods turned out to be or how you learned to write awesome concept-checking questions for grammar and vocabulary which by then you will be referring to as CCQs, further confusing your friends and family. Here you will find teaching ideas, sample lesson plans, discussions of common learner issues and ways of dealing with them as well as advice on doing the CELTA and the DELTA courses and presenting at conferences.